‘A real or imagined cause for complaint, especially unfair treatment’ or ‘a feeling of resentment over something believed to be wrong or unfair’, that’s how grievance is defined in our English dictionaries. Mahinda Rajapaksa’s current spell of whining fits right into that definition. And his whining has not ceased. His family members are being called many times by various investigative agencies. 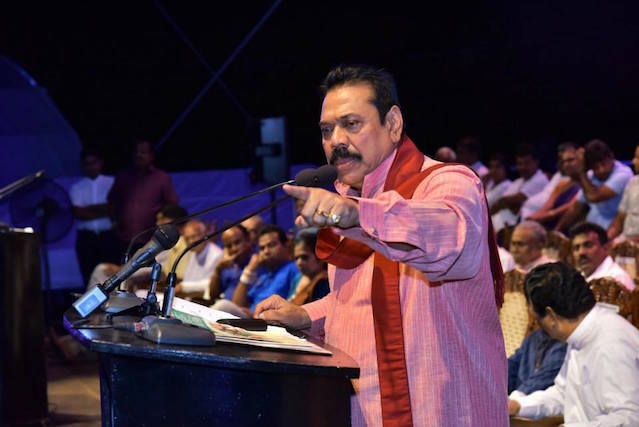 Along with these family members some of his leading supporters, close to nineteen (19), to name a few, Kumara Welgama, Mahindananda Aluthgamage and Udaya Gammanpila feature prominently among them. All these cohorts have already being questioned and Gammanpila and Aluthgamage in fact are out on bail. Investigative action takes place when some irregularity in administration, some palpably criminal activity or even some blatantly corrupt practices are smelled of and, an even more dangerous end the stench leads to, is recognized by those men of the law. It is not the law that was in play and practiced, most corruptly administered by those who wielded government powers during the Rajapaksa time. It is a different system now. In fact it is a better one than indiscriminate disappearances in ‘white vans’, better than killings of antagonistic journalists in broad daylight, better than removal of the Chief Justice by way of a select committee process within seventy hours, it is much better than arbitrary decrees by ‘Executive Presidency’. Arguments for and against Executive Presidency have begun to end. No one is interested in prolonging a system of Executive Presidency as was envisaged and practiced by the architects and engineers of the 1978 Constitution. When enormous powers are invested in one single authority, whether that power is very loosely checked by a parliament whose majority is held by the same man or woman who comes from the same political shade of that majority, enormous consequences cascade with or without that parliamentary checking system. JR Jayewardene who introduced this 1978 Constitution enjoyed five sixth’s (5/6) majority in the 1977 Parliament. The mind that was working on a stronger executive power to deliver goods on time for a long time while he was in the State Council and then in Parliament, as second in command until the physical demise of the incumbent leader (Dudley Senanayake) in almost all governments led by the United National Party (UNP), when assumed power with real power to back him with that massive majority in the House, introduced a constitution that could have been tolerable if those who held that power were nursed and nurtured in the discipline of era of the first half of the twentieth century. The 1956 transformation that dramatically affected not only the nation’s blend of leaders and the corners from which they originated, it also pointed to an end which seemed hazy at best and disastrous to the socio-economic balance of the nation at worst. Mahinda Rajapaksa is a direct product of that transformation. His father literally crossed the floor of the House of Parliament along with SWRD Bandaranaike, the leader of that ’56 transformation. The ’56-transformation, among others, had one singular and most radical influence on our electorate. I purposely use the word electorate as against society for the societal change that the ’56-transformation engendered was gradual while the on the electorate it was almost instantaneous and is lasting to date. That electoral effect underwent another shocking adjustment in 1977 but it lasted only 17 years, from ’77 to ’94. That ’77-change affected Mahinda Rajapaksa and it threw him out of parliament. The ’70 – ’77 government led by the Bandaranaikes was alleged to have given license to some willing parliamentarians to exercise unfettered political powers in their respective electorates and the Bandaranaikes gave administrative cover to such exercises. At the receiving end of those thuggish exercises were the supporters and financiers of the UNP. In fact, at the very beginning of the Bandaranaike-led government in 1970, in the wake of the UNP’s crushing defeat at the General Elections, JR Jayewardene the then Leader of the Opposition raised in Parliament the unprecedented violence unleashed by the SLFP supporters against the UNPers in the electorates. Prime Minister Mrs Bandaranaike’s response was thus: ‘let the SLFP supporters enjoy the unprecedented victory against the capitalist, imperialist-UNP’. The words of the first woman Prime Minster in the world were a shameful portrayal of the psyche of all Lankans. Takeover of the famous Buhari Hotel in Maradana under the Business Undertakings (Acquisition) Act (No. 35 of 1971) is another example of political victimization. Government-sponsored agitation against free-market-oriented business ventures began with vengeance. Mahinda Rajapaksa learnt his ABC of state-sponsored harassing of his opponents under the tutelage of a Master par excellence – Felix Dias Bandaranaike. Mahinda’s record-breaking span of ill-governance in the new century is now being questioned by many investigative agencies. His whining is about those investigations and various other allegations that are being debated and argued in the court of public opinion aside from the courts of law. Despite the undisputed fact that it was Mahinda’s regime that ended a twenty seven year-old war against the Tamil terrorists, and considering the sense of patriotism and its resultant ‘hero-savior’ image created for the consumption by the masses by the propagandists for the Rajapaksa clan, for Rajapaksa to suffer an electoral defeat at the hands of his own Party’s General Secretary was an insufferable shame. That is to say the least. Survival in politics is not easy. Especially in the current internet and Facebook era in which the life cycle of news is measured in minutes not days and weeks as was done about a decade ago, withstanding instant attacks with such unimpeachable authenticity is no mean task. Mahinda Rajapaksa has proven over the years that he is a survivor. He has a proven record in employing some of the best in the business in advertising and branding. Slogans such as ‘Uthuru Wasanthaya’ (Northern Spring), ‘Neganahira Udaawa’ (Rise in the East), ‘Maanushika Meheyuma’ (Humanitarian Operation) bear witness to the way he and his brothers tried to hoodwink the masses, especially after the war-victory. Such slogans were used to such an unbearable extent; the brothers became intoxicated in their own lies. When they began believing those lies, those lies had a more dangerous effect on their already–elongated egos. It gave them a sense of righteousness. That sense of righteousness gave them license to resort to any illegitimate and paralegal ventures. That phony patriotism founded on self-righteousness gave them an illusional warrant for another term of office. So was born the Eighteenth Amendment. In other words, the Eighteenth Amendment was a legal and constitutional manifestation of the avarice and pursuit of power and wealth by Rajapaksa and his corrupt clan. Now he does not have that power. He does not have the cover that protected his misdoings and corrupt practices. That is a great loss. One cannot underestimate the chaos that this ‘absence of cover’ creates, not only physically in the day-to-day work routine, the psychological chaos that it creates could be utterly devastating to the psyche of the ruler who is all of a sudden found naked and exposed. His whining is one of paradoxically logical responses to that loss of cover. One can empathize with the man, but to sympathize is to condone his very actions and misdeeds and would be as guilty as the man in question. One may even forgive him, but that forgiveness, if at all, must necessarily follow after justice is effectuated. Mahinda Rajapaksa is no fool. To portray him as one would be foolish for any investigator. Over the years he was in power as President of Sri Lanka, Mahinda surly has cultivated many friends and associates who stood by him during the dark nights of struggle and pain; many of those friends and associated may have fled him when he is out of power. But what would eventually stand by him are his own family and his siblings. Mahinda looked after his relatives while in power. His practice of nepotism knew no limits. Even the corrupt practices he is alleged to have been engaged in became exclusive to him and his family. The avarice that grew with him ultimately took its unkind toll. Every corrupt regime ultimately comes to that sad end. One should never disregard history’s lessons. How bitter or how drastic those lessons are, they are the only measurable yardsticks by which man can learn. Yet history repeats itself, for man has failed time after time. It is evident that Mahinda Rajapaksa and his cohorts are not willing to learn from history. Either they don’t know that there historical precedents or they deliberately chose not to regard them with any due weight. Mahinda’s whining is essentially a necessary by-product of the loss of power he suffered. He is amply displaying that he simply cannot come to terms with that by-product.